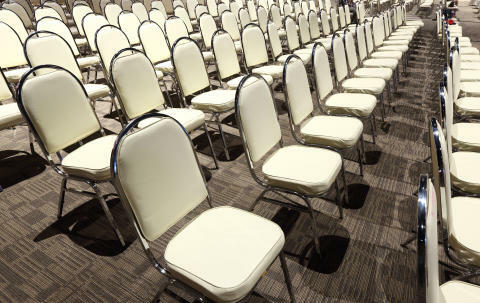 You've organised a seminar or conference, but many registered delegates don't show up. How can you ensure you get bums on seats? I'm gathering the best ideas to solve this problem. Here are some of my own to get you started. All event managers can relate to the scenario: you've organised a seminar or conference, but between 30% and 50% of registered delegates don't show up. As a professional conference anchor I see this all the time, but I also see best-in-class ways to avoid it. First, why don't registered delegates show up? Either the event has slipped in their list of priorities, or something has genuinely, urgently come up. "Seemed like a good idea at the time" – They were keenly interested when they signed up, but as the event date approached they became less and less inclined to attend. Maybe they just signed up to escape your insistent sales pitch. Maybe they just can't be bothered. Then, on the morning of the event they think, "nah, skip it". "I now have an urgent customer meeting to attend" – Most people prioritise meetings with customers and prospects above attending an event. "Technical difficulties" – Sometimes they sign up at event aggregation sites, but this doesn't actually convert into a Peatix or Eventbrite registration. "Forgot" – They actually wanted to attend, but forgot all about it. Send a calendar invite – Such a simple thing, yet I see this so rarely. I can't think of an event where the organiser doesn't have the email address of the delegates. Don't send them reminder emails. Send them a calendar entry! But make the most of it. Ensure it's time zone-enabled (your overseas guests will thank you for it) and enter specific location details in the address bar. The description field should contain all other relevant details. Instruct them to call you on your mobile if they can't find the venue, or are stuck in traffic. Sounds militant, but it re-emphasises the importance of your event. Invite delegates to shape the presentations – In your invitation ask delegates to identify the points they are most interested in, and what questions they have. Feed these to your speakers and ensure they address them during their presentations. Of course, you can still take "questions without notice" during the event. Charge a fee – I have found charging a fee, which is refunded in full when delegates attend, secures stronger commitment while not costing the delegate any money. More difficult to do when a company pays for their staff to attend (are they forced to return the money to their employer?) but works very well when the amount you set – perhaps $20 – is small enough to commit to, but big enough to attend to get the refund. Call each delegate in the lead-up to the event – Don't just email them, call them individually the day before the event. Big effort, but big reward. Call each delegate on the day of the event – Call them that morning individually to check they are on their way. If they don't show up, call them again. It might be too late for that event, but they will get the message that you take your events seriously. Build up to the event with content – Enlist your speakers to contribute blogs, photos and other valuable content to engage your delegates before the event. Provide a customer meeting area – A delegate is unable to attend because an urgent customer meeting has cropped up? Let them know you have set up a separate meeting area where they can have their meeting. Or provide free passes for your delegates' customers. Provide a de-registration button – wow, that's courageous, but it allows delegates to be honest about their intentions, and not have to make up excuses when they don't attend. Invoice them – again, a courageous move, especially if it's a lead generation event where you want to build a relationship with prospective customers. But it does underscore that you take the event seriously, and so should they. Of course, delegates also have a responsibility to attend an event they have committed to. If you are half-hearted about an event, or unlikely to be able to attend, don't sign up for it in the first place. Call ahead if you can't make it. What's the worst the event organiser will say to you? Speaking of being on time, in part two of this series I will discuss how to dissuade event attendees from leaving early. Now, what are your suggestions for how can you get registered event delegates to actually show up? Discuss the suggestions below.